Cary and it’s citizens have always been committed to the environment – and now we have proof. Certifiable proof. Oh, wait – I have to explain. 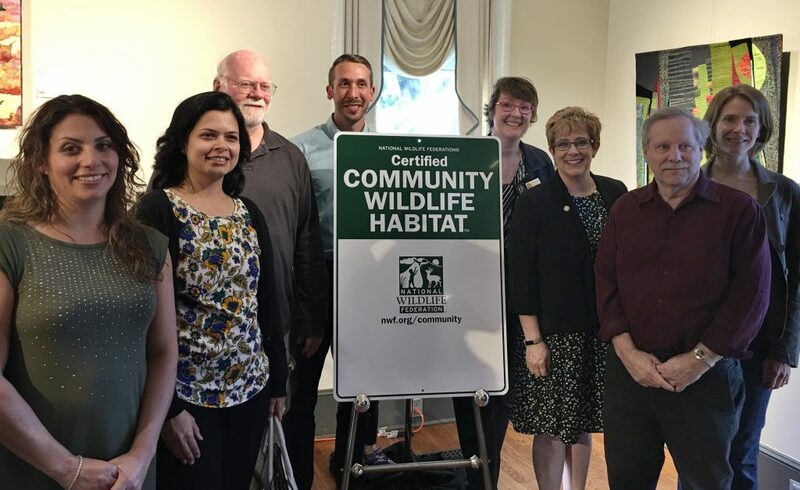 About 2 years ago members of the Environmental Advisory Board brought forward a great idea – to work with residents, businesses and organizations throughout the Town to create wildlife habitats in their yards and gardens, at schools, public spaces, and places of worship. The goal – to give people a way to connect to their natural world, whether through enticing birds, butterflies or bees, or other wildlife – right where they are. 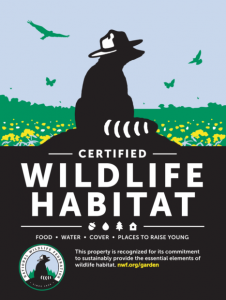 The Garden for Wildlife program sponsored by the National Wildlife Federation (NWF) is about blooming these possibilities across the community – providing tools, guidance and a way to certify participation of your garden space. Making a sustainable habitat is relatively easy and a way for us all to reverse some of the human-caused habitat destruction that has hurt wildlife. Whether you have rain barrels, compost, used native plants in your garden or yard, or hung bird feeders or installed bird baths– you are doing your part to help. 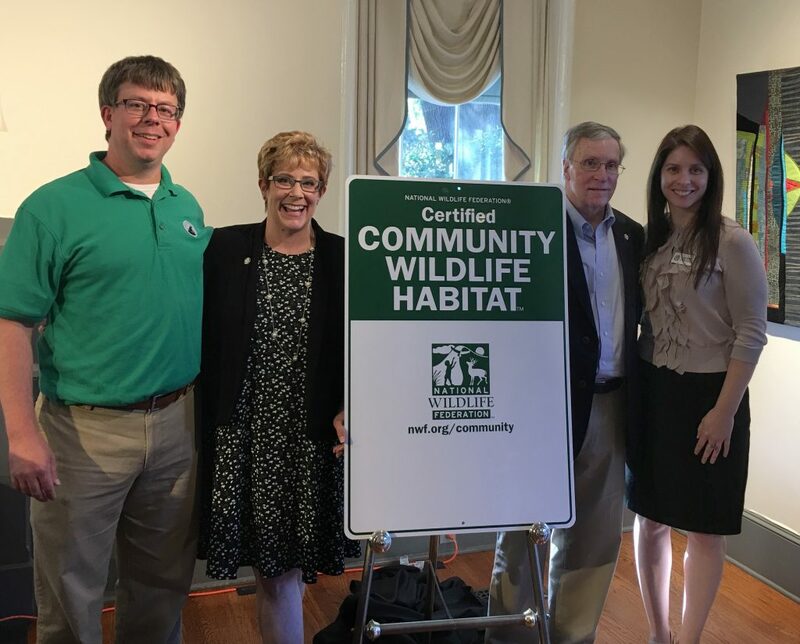 Last night several community members from various organizations that participated in the program, including the members of the EAB, Mayor Pro Tem Ed Yerha, a number of Staff members were joined by a Patrick Fitzgerald, The National Wildlife Federation’s Senior Director of Community Wildlife from Washington DC and Liz Rutledge from the NC Wildlife Federation, to present Cary with a Certificate recognizing Cary as a Community Wildlife Habitat. This is quite a milestone in our history! 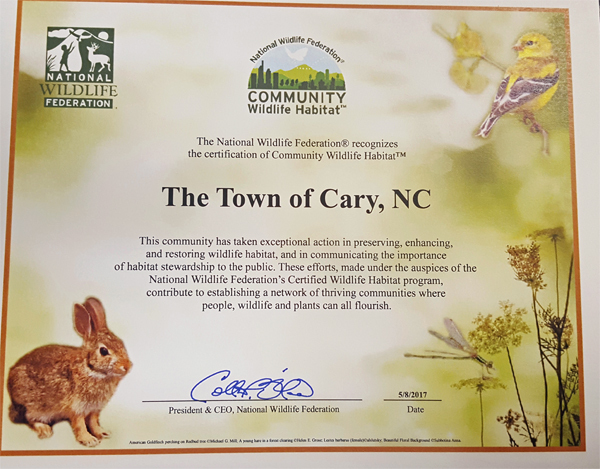 For Cary to earn this standing over 400 homes, 5 schools and 3 common areas (like churches) in Cary were individually certified as wildlife habitats. We are now the 101st community to be recognized across the country – and the FIRST in the TRIANGLE to have this designation! After the suggestion was approved our Sustainability Office took lead and collaborated with our other departments, such as Parks, Recreation and Cultural Resources and Public Works. 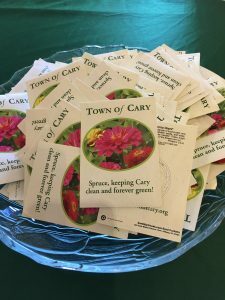 This type of multi departmental collaboration assisted greatly in the Town of Cary reaching their certification goal in less than two years when most communities take five. To reach our goal, we had to host multiple environmental outreach and education events, many of these were coordinated through our Spruce program – while Town staff worked to inspire our community members to make simple steps in their own outdoor spaces to support wildlife. 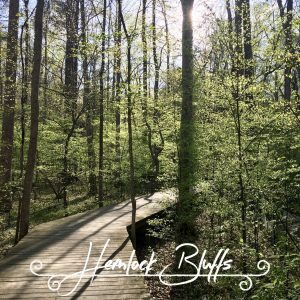 From Earth Day to Compost Workshops to nature walks at Hemlock Bluffs citizens learned about the importance of making their lawns, school yards, and outdoor areas friendly to pollinators and all the wildlife that is so crucial to a healthy ecosystem. As part of this achievement – you will soon see these great signs across the community, recognizing our achievement and commitment to the environment. Our entire community should be proud of this accomplishment, and we’re not done! The fee can be paid online when you fill in your application. This fee helps the NWF increase declining habitat for bees, butterflies and birds and other wildlife nationwide! 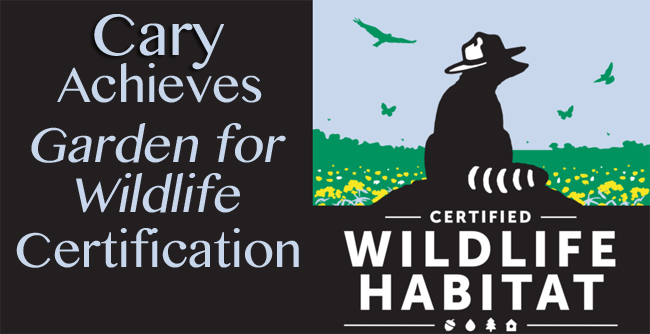 You will also get a personalized certificate once your habitat is certified, 10% off NWF catalog merchandise, such as a yard sign proudly declaring your yard as a certified Wildlife Habitat a Subscription to monthly e-newsletter Garden for Wildlife, and One full-year’s membership to NWF and s one-year subscription to its National Wildlife magazine. To learn more you can also check out the “Cary It Green” Facebook page. By the way – if you want to be part of one of our great boards and commissions – NOW IS THE TIME! Apply now to make a difference for your community – we need you and your skills to continue to make Cary great.